A lovely London blue topaz and cubic zirconia ring elegantly set in sterling silver brought to you by the fine gemstone experts at Apples of Gold. 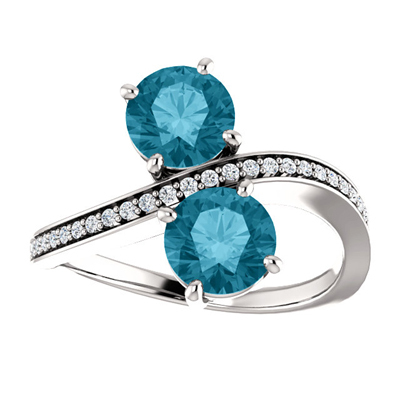 Wear this ring to show off the perfect sparkling blue topaz and cubic zirconia jewels. This two stone ring is the easy to wear accessory that goes with everything. Measurements of 6mm and a total carat weight of 0.13. We guarantee our London Blue Topaz and CZ Two Stone Ring in Sterling Silver to be high quality, authentic jewelry, as described above.